We were recently given the opportunity to review MrChewy.com and are very excited to tell everyone about their large product selection, fair prices and fabulous customer service! \With 4 pudgy well fed Lapdogs in the house, I am always buying food and treats in bulk, especially when the price is right. However, when it comes to online shopping I often find great prices, but the savings quickly disappears once shipping charges are added on. Then I'm waiting 2 weeks for the order to arrive! Sometimes I'll find free shipping offers, but then the prices of the items are higher than what I can get locally. Here's where MrChewy.com, an online pet food retailer offering more than 70 brands of pet food, treats and supplies, is different! They offer free 1 - 2 day shipping on any order over $49 (and orders under $49 pay just $4.95)! 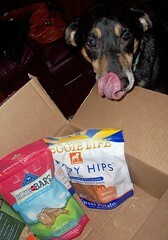 For your convenience, you can even set up automatic shipments for your dog or cat food. As an added bonus, you'll save 15% off your order the first time you set up an automatic shipment and you can cancel anytime. Just think -- no more last minute trips to the pet store when you're running low on food! I placed our order just before Christmas and received it 2 days later. The Lapdogs think any box that comes into the house must be for them and Tut was right there to check this one out. Because I stock up on our dog food at the local pet supply store when they have their can't-beat-the-price coupons, I opted to order a variety of tasty treats. The Lapdogs were spoiled with some of their old time favorites and a couple newbies... Blue Buffalo Pumpkin & Cinnamon Health Bars, Blue Buffalo Chicken & Cheddar Mini Bars, PureBites Freeze Dried Liver Treats, Zukes Carrot Crunch Z-Bones, Dogswell Happy Hips Sweet Potato Chews and Natural Choice Crunchy Apple Treats. 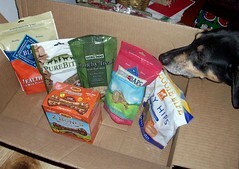 The Lapdogs couldn't have been happier with this goody filled box and the humans couldn't have been happier with the outstanding customer service from MrChewy.com. We will order from them again and again. I love that I can order high quality treats from the comfort of my own home at a good price, receive free shipping and have my order within 2 days! You really can't beat that and the Lapdogs give MrChewy.com their the official 16 Paws Up Lapdog Seal of Approval! They all suggest you give them a try and order some yum-yums for your pack today (and yes, they are even including the c-a-t-s in this)! You make #4. Lots of folks are jumping on the Mr Chewy train. We're curious, but I don't have time to explore right now! We're customers now. In fact I need to go order some food today. The service is great and it sure beats having to drive across town in the winter. Thank you so much for the wonderful review! We strive for perfection, so we're very glad that you enjoyed your experience with us! Please don't hesitate to call, chat or email us if you ever need assistance - we are always here and happy to help! Thanks again! !